300+Senior Decision Makers will Attend! By the mid-2020s, virtually all new vehicles will have data connections. As we add more driver assist and automation features, the potential for a bad actor to target the transportation system and either steal data, strand vehicles or send them crashing into each other will be vastly larger. Nearly three-quarters of vehicles sold this year will have a telematics system, according to Colin Bird, senior analyst of automotive technology at IHS Markit, and the likelihood of attacks will increase as more vehicles become more connected. At the same time, vehicle defenses haven’t yet caught up to the potential problems.OEM-Supplier relationship is on the spotlight with this new rise of cyber threats that are here to shake the automotive industry. 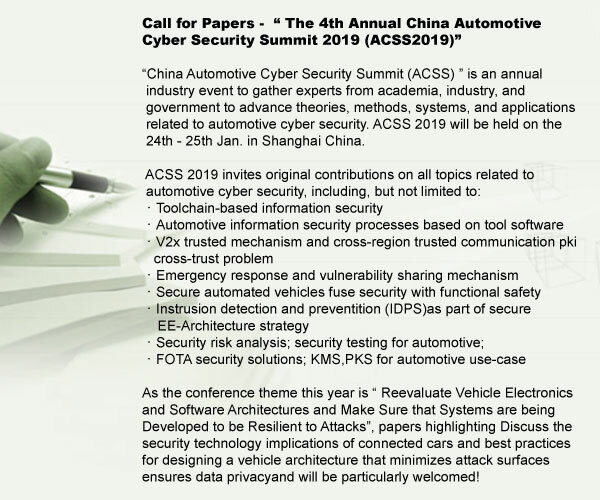 The most authoritative and updated industry insights toward Automotive cyber security industry. 50+ international and China online and offline media agencies will attend and report the event worldwide; rich media activities including media conference, one to one interview, product debut media conference etc. 1：Anshi Technology is a team with strong technical skills and practical experience to track the latest security trends at home and abroad, focusing on application security, software security, emergency response, risk assessment and other fields. He has won several outstanding eco-partnership awards for large-scale security platforms; members won personal second and third prizes in the Shanghai Unicom Cup Information Security Skills Competition; and also won the nomination of Smart City Construction “Smart Craftsman”. 1：NIO’s mission is to shape a joyful lifestyle by offering smart, premium electric vehicles and providing the best user experience. NIO was founded in November 2014 as a global company. With world-class research and development, design and manufacturing centers in Shanghai, Beijing, San Jose, Munich, London and nine other locations, NIO now has more than 6,000 employees from nearly 40 countries. By the end of 2018, NIO will have user service centers in 24 different cities and the capability to serve users in over 300 cities across China. The NIO Formula E Team secured the inaugural Drivers’ Championship title in 2015. In 2016, NIO unveiled the fastest electric car in the world, the EP9. The EP9 set the lap record for an electric vehicle at the Nürburgring Nordschleife and three other world-renowned tracks. In 2017, NIO unveiled its vision car EVE and announced the NIO EP9 set a new world speed record for an autonomous vehicle at the Circuit of the Americas. NIO officially began deliveries of the ES8, a seven-seat high performance electric SUV, on June 28, 2018. 1：Volvo Cars is a company on a mission; to bring traditional car manufacturing into a connected, sustainable and smart future. We are committed to safety, creating innovative cars that make life less complicated for our consumers. In 2010, we decided to transform our business, resulting in a totally new generation of cars and technologies, as well as steady growth and record sales. Today, we’re expanding our global footprint in Europe, China and the US. We believe in the power of people and are constantly pushing our own skills and abilities to drive change in the automotive industry like never before. 1：Rapidly advancing technologies and a maze of new risks are creating unprecedented challenges for vehicle manufacturers and their partners. Our independent market research, insight, and consultancy are helping to create smarter, more secure, better connected, and increasingly autonomous cars. Having built a reputation for robust data and expert advice, as well as an ability to attract and retain the industry’s most talented specialists, this year SBD Automotive earned a place on the Sunday Times SME Export Track’s 100 Fastest Growing Companies, and received the Queen’s Award for Enterprise - a much-coveted award for outstanding achievement by UK companies. 1：At LG, we deliver products and services that make lives better, easier and happier though increased functionality and fun. Put simply, we offer the latest innovations to make “Life Good” – from home appliances, consumer electronics and mobile communications to business innovations in digital signage, air conditioning, solar and LED lighting. As a global leader, we strive for greatness in product leadership, market leadership and people leadership to realize our growth strategies. 1：IEEE is the world’s largest professional association dedicated to advancing technological innovation and excellence for the benefit of humanity. IEEE and its members inspire a global community through its highly cited publications, conferences, technology standards, and professional and educational activities. IEEE is the trusted “voice” for engineering, computing and technology information around the globe. There are more than 421,000 IEEE members in more than 160 countries. The IEEE publishes a third of the world’s technical literature in electrical engineering, computer science and electronics and is a leading developer of international standards that underpin many of today's telecommunications, information technology and power generation products and services. For information about the IEEE - visit http://www.ieee.org. 1：IBM is a leading cloud platform and cognitive solutions company. Restlessly reinventing since 1911, we are the largest technology and consulting employer in the world, with more than 380,000 employees serving clients in 170 countries. With Watson, the AI platform for business, powered by data, we are building industry-based solutions to real-world problems. For more than seven decades, IBM Research has defined the future of information technology with more than 3,000 researchers in 12 labs located across six continents. For more information, visit www.ibm.com. 1：HORIBA MIRA is a global provider of pioneering engineering, research and test services to the automotive, defence, aerospace and rail sectors. We work in close collaboration with vehicle manufacturers and suppliers around the world, providing comprehensive support ranging from individual product tests to turnkey engineering design, development and build programmes. With over 70 years’ experience in developing some of the world’s most iconic vehicles, our engineers utilise the latest test facilities and simulation tools to make vehicles and journeys safer, cleaner, more efficient and rewarding. Our suite of 37 major test facilities, 100km of specialised proving ground and wealth of engineering experience, combined with our expanding international presence, means we are confident that we can achieve our vision – that by 2020 every journey in the world will be positively influenced by us. 1：China Automotive Technology and Research Center Co., Ltd. (CATARC) established in 1985, is a central government-level enterprise belonging to the State-owned Assets Supervision and Administration Commission of the State Council and a comprehensive science and technology corporate group with extensive influence in the automotive industry home and abroad. We own total assets of nearly USD 1.6 billion including net assets USD 1 billion and covers an area of about 5.4 km2. Meanwhile we have built the talent pyramid based on chief expert, reserved subject leader and young science and technology cadre, which is a human resources team with high educational background and proficiency in skill and management. 1：Haima Automobile Group Co., Ltd. is located in Jinpan Industrial Zone in Haikou of China. The Company has a registered capital of 1.64 billion RMB and total assets of 13 billion RMB. Haima, which was listed in Shengzhen Stock Exchange in 2008, mainly specializes in automotive industry. Haima Automobile Group consists of Haima Car Co. Ltd., Haima Commercial Vehicle Co., Ltd., FAW Haima Automobile Co. Ltd., Shanghai Haima Research & Development Co., Ltd., Haima Finance Co. Ltd., Jinpan Industry Co. Ltd. etc. Since its founding in 1988, over the past 20 years, Haima has already had three bases in Hainan, Henan and Shanghai and a product portfolio covering minivans, cars, MPV, SUV and new energy vehicles. It employs over 10,000 staffs while its affiliated companies employ over 30,000 staffs. Haima has annual revenue exceeding 10 billion RMB and has paid 10 billion RMB of grand total taxes. 1：Great Wall Motor Company Limited is China’s largest SUV and pickup manufacturer. We were listed on the Hong Kong Stock Exchange in 2003 and the Shanghai Stock Exchange in 2011. By September 30, 2014, our assets had amounted to 54.305billion yuan. Now Great Wall Motors owns two brands--Haval and Great Wall which covers three categories: SUV, passenger car and pickup.. With over 30 holding subsidiaries, more than 60,000 employees, four vehicle manufacturing bases, we have developed the independent matching capacity of core parts such as engine and transmission. 1：Through creativity and commitment we create value for our customers, employees and investors. We understand how semiconductors increase the performance of modern technology and enable solutions that will shape our lives today and tomorrow. Developed with passion and manufactured with precision, every single product proves our will to succeed. This is what makes us a reliable partner and helps our customers to become even more successful. 1：Yanfeng Automotive Interiors (YFAI) is the global leader in automotive interiors. Yanfeng Automotive Interiors is redefining how people relax, work and play inside their vehicle interiors – today and decades from now. Headquartered in Shanghai, the company has approximately 110 manufacturing plants and technical centers in 20 countries and more than 33,000 employees globally. They design, develop and manufacture automotive interior components for all automakers. Established in 2015, Yanfeng Automotive Interiors is a joint venture between Yanfeng, one of the largest automotive suppliers in China and Adient, the global leader in automotive seating. 1：At General Motors, we are passionate about moving towards a world with zero crashes, zero emissions and zero congestion. This vision unites us each and every day, and this transformation begins with the world’s greatest employees. 1：China Taier Laboratory (CTTL) was established in 1981. The administration is affiliated to the Telecommunications Research Institute (CATR) of the Ministry of Information Industry and is authorized by the Ministry of Information Industry and the General Administration of Quality Supervision, Inspection and Quarantine. It is a high-tech organization integrating communication technology development research, communication product standards, test methods, communication measurement standards, measurement methods, and testing, verification, technical evaluation, test instrument measurement, and communication software evaluation and verification of domestic and foreign products. .
1：NavInfo is a China-based technology company leading the way to becoming the “Digital Brain of Intelligent Driving” with core businesses in HAD mapping, high accuracy positioning and automotive-grade semiconductors for ADAS and autonomous driving. Founded in 2002, NavInfo is the market leader in navigation map, dynamic traffic information, navigation software development and state-of-the-art customized telematics solutions to both passenger and commercial vehicles. Now, NavInfo is ushering in the age of autonomous driving with a comprehensive technology development strategy and laying the foundation to become one of the most trustworthy autonomous driving solution providers in the China market and beyond. 1：SAIC Motor Corporation Limited (informally SAIC, formerly Shanghai Automotive Industry Corporation) is a Chinese state-owned automotive manufacturing company headquartered in Shanghai, China with multinational operations. One of the "Big Four" Chinese automakers (along with Chang'an Motors, FAW Group, and Dongfeng Motor),the company had the largest production volume of any Chinese automaker in 2012 producing more than 4.5 million units, 76% of which were passenger vehicles. Its manufacturing mix likely includes a much smaller percentage of consumer offerings, as many (1,000,000+) SAIC passenger vehicles are pint-sized commercial vans. 1：Shanghai Jiao Tong University (SJTU), as one of the higher education institutions which enjoy a long history and a world-renowned reputation in China, is a key university directly under the administration of the Ministry of Education (MOE) of the People's Republic of China and co-constructed by MOE and Shanghai Municipal Government. Through 121 years' unremitting efforts, SJTU has become a comprehensive, research-oriented, and internationalized top university in China. 1：ChinaGPS Co., Ltd. (Shenzhen) was established in 1999. As a leader of telematics and automotive field in China, ChinaGPS is specialized in telematics and automotive intelligentized products development, manufacturing and sales, and also provides telematics TSP service. 1：Venustech has a state-level network security technology research and development center and a world-class security research and service team. It has applied for hundreds of technical patents and made many pioneering achievements in the industry: the world’s first IDS hardware product, China’s first distributed vulnerability scanning system, China’s first 10 Gigabit multi-core UTM platform, realization of significant breakthrough in 10 Gigabit UTM core technology and China’s first postdoctoral workstation for the enterprise's network security. To date, Venustech has dig out 74 common vulnerabilities and exposures in total, the highest record across Asia. Venustech was the first enterprise in China to join Microsoft MAPP program. 1：Chery Automobile Co., Ltd. was founded on January 8, 1997 in Wuhu, Anhui Province, China. Chery adheres to independent innovation, gradually establishing a complete technology and product R&D system as well as several famous series, including EXEED, ARRIZO, TIGGO, QQ and FULWIN. Chery products are exported to more than 80 countries and regions in the world. Its two JVs own other brands, such as JAGUAR, LAND ROVER and QOROS, etc. So far, more than 7 million units have been sold, making Chery the first Chinese automobile brand whose sales have exceeded 7 million units. Chery's total export volume has reached 1.3 million, ranking No. 1 in China for 15 years in a row. 1：Mazda Motor Corp. engages in the manufacture and sale of passenger cars, commercial vehicles and automotive parts. It operates through the following segments: Japan, North America, Europe, and Other Areas. Its products include passenger cars, commercial vehicles, trucks, various engines, transmission parts, machine tools, and materials for casting. The company was founded on January 30, 1920 and is headquartered in Aki, Japan. 1：Kaspersky Lab is the world’s largest privately held vendor of endpoint cybersecurity solutions. We save the world! The company is ranked among the world’s top four vendors of security solutions for endpoint users. Throughout its more than 20-year history Kaspersky Lab has remained an innovator in IT security and provides effective digital security solutions for large enterprises, SMBs and consumers. Kaspersky Lab, with its holding company registered in the United Kingdom, currently operates in almost 200 countries and territories across the globe, providing protection for over 400 million users worldwide. Learn more at www.kaspersky.com. 1：The Third Research Institute of Ministry of Public Security Run Technologies Co.,Ltd. Beijing provides research services on information and network security, Internet of things, special operations communications, illegal drugs control, and public security protection techniques. The company was founded in 1978 and is based in Shanghai, China. 1：China Academy of Telecommunication Research (CATR), with its predecessor being China Academy of Posts and Telecommunications of the former Ministry of Posts and Telecommunications (MPT) established in the mid-1950s, has since its founding undertaken a great deal of major research for the country and the industry. It has thus accumulated rich experience in communications policies, standards for telecommunication technologies, planning of communications development, and product testing and certification, making great contributions to the development of communications industry in China. 1：Toyota Motor Corporation is a global automotive industry leader manufacturing vehicles in 27 countries or regions and marketing the company’s products in over 170 countries and regions. Founded in 1937 and headquartered in Toyota City, Japan, Toyota Motor Corporation employs nearly 350,000 people globally. 1：NXP Semiconductors N.V. (NASDAQ: NXPI) enables secure connections and infrastructure for a smarter world, advancing solutions that make lives easier, better, and safer. As the world leader in secure connectivity solutions for embedded applications, NXP is driving innovation in the secure connected vehicle, end-to-end security & privacy and smart connected solutions markets. Built on more than 60 years of combined experience and expertise, the company has over 30,000 employees in more than 30 countries and posted revenue of $9.26 billion in 2017. Find out more at www.nxp.com. 1：Neusoft provides innovative information technology – enabled solutions and services to meet the demands arising from social transformation, to shape new life styles for individuals and to create values for the society. Neusoft was established at Northeastern University, China in 1991. Today, Neusoft has about 20,000 employees worldwide, and it has 10 software R&D bases, 8 regional headquarters and a comprehensive marketing & service network covering 60+ cities across China, as well as subsidiaries in the United States, Japan, Europe, the Middle East, and South America. It was the first listed software company in China, also the country’s first one in the industry that had received both CMM Level 5 and CMMI V1.2 Level 5 certifications. 1：The Volkswagen Group with its headquarters in Wolfsburg is one of the world’s leading automobile manufacturers and the largest carmaker in Europe. The Group is made up of twelve brands from seven European countries: Volkswagen, Audi, SEAT, ŠKODA, Bentley, Bugatti, Lamborghini, Porsche, Ducati, Volkswagen Commercial Vehicles, Scania and MAN. 1：China Datang Corporation (CDT) is a leading central state-owned power generation enterprise in China and the experimental state-authorized investment and state share-holding enterprise ratified by the State Council. CDT is mainly specialized in power production and supply, power related coal mine development and production as well as related professional technical services. 1：The Bosch Group is a leading global supplier of technology and services. It employs roughly 402,000 associates worldwide (as of December 31, 2017). In 2017, the company generated sales of 78.1 billion euros. Its operations are divided into four business sectors: Mobility Solutions, Industrial Technology, Consumer Goods, and Energy and Building Technology. 1：„Vorsprung durch Technik“ – with pioneering courage and team spirit, Audi employees breath new life into those words each and every day. Applying critical thought to the status quo, they bring unique and innovative ideas to fruition in a work atmosphere of creative freedom where the seemingly distant future is already taking shape. 1：Groupe PSA designs unique automotive experiences and delivers mobility solutions to meet all customer expectations. The Group has five car brands, Peugeot, Citroën, DS, Opel and Vauxhall, and provides a wide array of mobility and smart services under the Free2Move brand. Its ‘Push to Pass’ strategic plan represents a first step towards the achievement of the Group’s vision to be “a global carmaker with cutting-edge efficiency and a leading mobility provider sustaining lifetime customer relationships”. An early innovator in the field of autonomous and connected cars, Groupe PSA is also involved in financing activities through Banque PSA Finance and in automotive equipment via Faurecia. 1：ALIBABA GROUP'S MISSION IS TO MAKE IT EASY TO DO BUSINESS ANYWHERE. We provide the fundamental technology infrastructure and marketing reach to help merchants, brands and other businesses that provide products, services and digital content to leverage the power of the Internet to engage with their users and customers. Our businesses are comprised of core commerce, cloud computing, digital media and entertainment, innovation initiatives and others. Through investee affiliates, we also participate in the logistics and local services sectors.